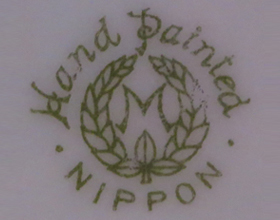 Welcome to the exciting world of collecting Nippon Porcelain! The International Nippon Collectors Club (INCC) was founded in 1982 by a group of Nippon enthusiasts with a vision to form an organization through which fellow collectors with a common interest in Nippon could exchange knowledge and share friendship. Little did they know that this once small group would expand to a membership representing virtually every state as well as Canada and Japan. The International Nippon Collectors Club promotes a free exchange of information related to the porcelain wares referred to as Nippon. These wares of the Nippon era were manufactured in Japan in the period of 1890 to 1921, and exported, primarily to Europe and the United States. The mission of the club is to attract new members through active educational programs, an interactive website and an exciting annual three day convention. Our mission statement is a reflection of our goals, which are to educate the public and other collectors through the use of our club activities and outreach programs related to this fine Nippon porcelain. Receive four issues of the full-color INCC E-Journal every year. Click here to download a sample. We thank you again for your interest & look forward to your joining our friendly family of Nippon enthusiasts! We have added an INDEX OF ARTICLES to the site to more easily find articles of interest in the past journals. © 2019 International Nippon Collectors Club. All Rights Reserved.